It's an unfortunate fact that if you excel in too many fields at the same time, the net effect is that people's minds will shut down trying to take it all in. There have been many modern-day renaissance men in the last 100 years, whose genius overlaps into many different subjects, from botany to electronics to philosophy to religion, and they rarely get their deserved due from the public, who tend to prefer that you pick one realm of research and stick to that. Take Constantine Rafinesque for example. He was a self-educated polymath and a polyglot who made great breakthroughs in the fields of zoology, meteorology, geology, anthropology, linguistics, and more - but was officially honored by academia for none of his accomplishments during his lifetime. 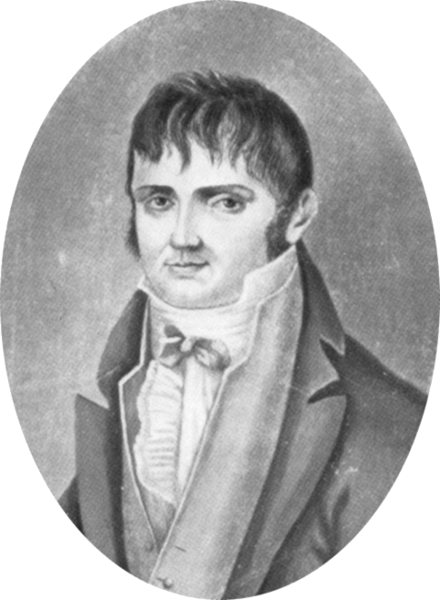 In 1819 Rafinesque became professor of botany at Transylvania University in Lexington, and also tutored in French and Italian. His erratic personality and ahead-of-his-time views, however, kept him in constant trouble with the University and with his peers in the scientific community. In 1826 he and Transy parted ways after a heated argument with its president, Horace Holly. Some versions of the story say he was fired, others say he walked out. Either way, Rafinesque announced he had placed a curse on Transylvania University and Mr. Holly, a threat which no doubt elicited little more than droll chuckles around the faculty lounge. But then Holly himself was ousted from power by his own board, and soon thereafter died of Yellow Fever. And two years later, the Transy administration building was destroyed in a fire. Some may have, at that point, asked themselves if there wasn't something to the mad professor's curse. Perhaps in a move to pacify Rafinesque posthumously, it was arranged after his death to bring his remains back to Transy to be interred in a crypt room inside Old Morrison Hall. For many years having his remains here was a point of pride for the school. But then, even in death, Rafinesque messed with them once more: it was recently discovered that they got the wrong body. A campus secret society known as "The Hemlock Society" had been charged with the task and mistakenly exhumed the corpse of a woman named Mary Ann Passamore from a pauper's graveyard in Philadelphia instead of Rafinesque's.